Last month, I cited data from Economic Freedom of the World to explain that the United States was becoming less competitive because of creeping protectionism and reductions in the rule of law and property rights. Now I have more bad news to share. Last year, the United States ranked #12 for economic liberty. But according to the new rankings released yesterday, the United States now has dropped to #16. Here are the new rankings (based on a 0-10 scale), with Hong Kong and Singapore once again leading the pack. Why did the United States drop? In part, because our score fell from 7.81 to 7.73, but also because of what happened to the scores of other nations. 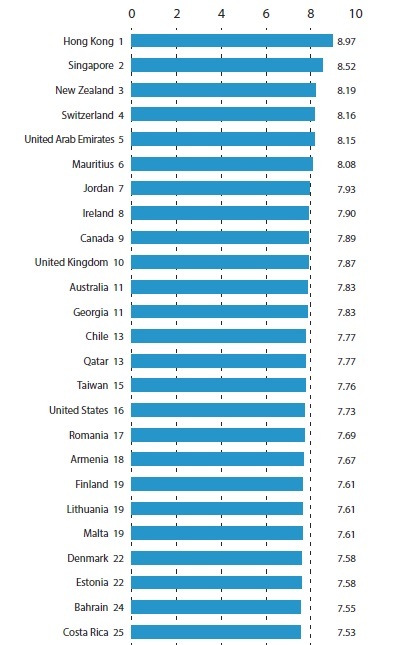 The bottom line is that Georgia, Taiwan, Qatar, Ireland, and the United Kingdom jumped ahead of the United States, while Finland fell behind America. Now let’s get more depressed. If you dig through the archives and get the rankings for 2000, you can see that the latest fall from #12 to #16 is part of a very disturbing pattern. The United States used to be #3 in the world, with a score of 8.5. Wow, falling from 8.5 to 7.73. That’s definitely an indictment of statist policy during the Bush and Obama years. But I’m going to share even more depressing data. The folks at the Fraser Institute who put together Economic Freedom of the World retroactively alter scores and rankings as they get more data (sort of the way the U.S. government periodically revises GDP and employment data). So if you look at their big excel spreadsheet, you’ll see that the United States actually wound up ranked #2 in 2000 with a score of 8.65, marginally ahead of Singapore, which had a score of 8.61. So we’ve actually dropped from #2 to #16 in the rankings, and our score has plunged from 8.65 to 7.73. I’ve saved the worst for last. 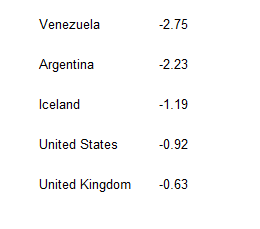 I crunched the numbers to see which nations suffered the biggest declines since 2000. As you can see, the United States has the unfortunate distinction of being on a list with basket case economies such as Venezuela and Argentina. To make matters worse, at least the U.K. has been moving in the right direction in recent years, with a slight increase from 7.80 to 7.87 between 2010 and 2013. And Iceland also has been trying to improve. Its score has jumped from 6.43 to 6.87 over the past three years. The United States, by contrast, has downward momentum. P.S. The nation with the biggest improvement since 2000 is Romania. Thanks to reforms such as the flat tax, its score has skyrocketed from 5.31 to 7.69, an increase of 2.38 points. At this rate, they’ll easily pass the United States in next year’s rankings. No need to look at rankings as far as seeing the direction of the trendline. The march towards more coercive collectivism is palpable everywhere. Most importantly in every day conversations with voter-lemmings. Unfortunately the pendulum in America is still swinging in the wrong direction, and poised to continue on the same course. Towards less economic freedom, and towards a public that increasingly wants more and more centralized collective control of as many aspects of economic activity as possible. The voter-lemmings’ desire to control and enable more redistribution through bigger government is irresistible. But I’m afraid that this is just the beginning of a much more significant societal and prosperity decline. The American electorate seems to have crossed the Rubicon. Having now converged significantly with the lower growth and declining economic trajectories of European nations, Americans are starting to feel the direct and indirect effects of slow growth. A growth that is now structurally half the world average. Americans are thus seeing their once enviable prosperity rankings decline on a worldwide basis. Middle class Americans are becoming middle income people of an increasingly middle income country, as their wages and prosperity continue to grow at only half the average world rate. The standard modus operandi when electorates start making these choices, is to try to claw back lost prosperity rankings through more and more redistribution. And American voters start voting like Europeans. Their already anemic subpar growth converges even more to European levels. Decline becomes arithmetically deterministic. The numbers are unsparing. What you are living through is no less than the decline of America. The decline is encapsulated in a growth rate that is half the world average. These are the pivotal early 21st century years where America takes a wrong turn and its prosperity, might, and world influence, takes a dive. Decline feels like a slow process when you are going through it, but it’s precipitous on a historical time scale. Expect things to accelerate even further, as everything human continues to pick up speed irreversibly as the 21st century gets under way. Ascents and declines that used to take centuries will now unfold in a few short decades. It is clear what America’s trendline is. I can’t help but notice the rapid rise of UAE. American voter-lemmings, together with electorates of other advanced democracies are making such poor choices, bamboozled by the promises of coercive collectivism, that even dictatorships are starting to give them a run for their money. The Darwinism of faster vs slower growth is unsparing. It does not care if bad choices are made in a democratic or authoritarian way. The result is pretty much the same: Decline. Your point (I agree) is that both US lowered economic standing and less manufacturing activity is due to high taxes. That is the fault of rapacious government and suffocating regulation, not of productive people choosing where to produce. A proper government regulates lightly and secures liberty. This includes the liberty to be productive anywhere, here or in other countries (as they might allow). If you want more of the stifling bureaucracy which has led to our economic decline, have rules which force US citizens to hire more US workers or build businesses here rather than there. The benefits of trade are the lowered prices to buy things, a benifit to the masses and especially to poorer people. Lowered prices for industrial inputs also benefit most businesses, but definitely hurts businesses in competition to the imported products. So what? 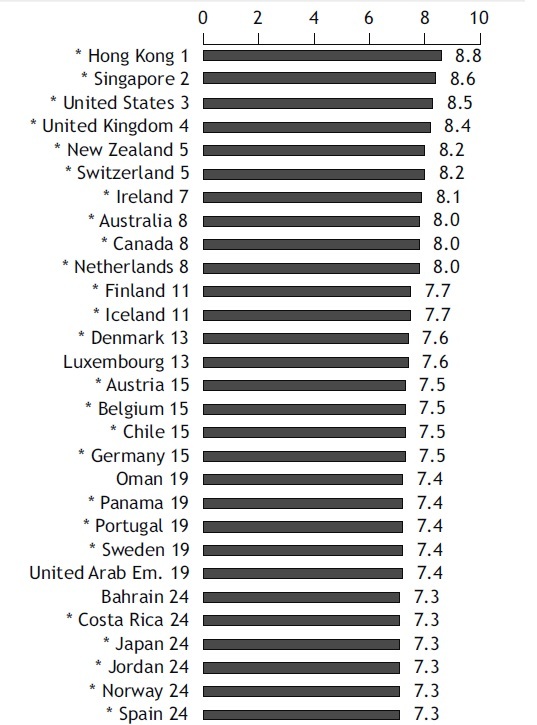 Consumer individual rights are highest in a free society. Domestic business lobbies for tariffs and rules to restrict imports in its industry, sometimes arguing at the same time for more imports of the things they buy. They would restrict imports from other US states if they could find an argument which wasn’t laughable. Ironically, more restrictions on business freedom and on imports adds to the regulatory burden which has gotten us to this point and will further reduce our employment and prosperity. Regulation and tariffs help the real rober barrons, the corporations receiving favors and special laws from the bribed representatives of our socialist government. It’s not because of “protectionism” that our economic standing has gone downhill. The (over-)taxation IS one of the big problems. The other, is that the (due to the previous-mentioned reason) manufacturing industry has all but left the country (especially in pursuit of cheap slave-labor). GATTS, NAFTA, and the whole lot of these so-called “free-trade” agreements has done nothing to actually benefit the United States, but more to line the pockets of our well-known “robber barons” of the modern era. An impoverished nation is far easier to dominate than a wealthy, productive one.